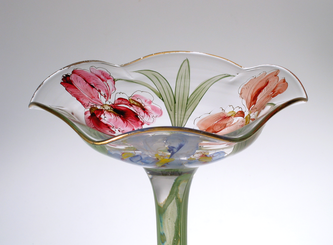 Not all Pairpoint glass items were decorated at the time of manufacture. Perhaps half were left "plain." 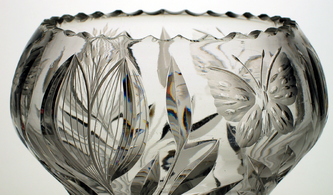 When Pairpoint glass was decorated, it was primarily done in two ways…engraving or cutting. 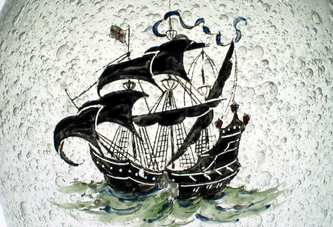 Both methods involved using stone or copper wheels to remove the surface of the glass resulting in the intended design. Generally copper wheel engraving was used for shallow intricate designs, while stone wheel cutting removed more material in less intricate ways. Both methods could be combined in one design. Engraving and cutting would leave behind a rough (gray-looking) surface which could be left untouched or polished by chemical or mechanical means, depending on the designer's intention. 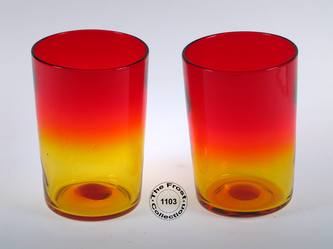 Pairpoint glass was never chemically etched, as was most glass made by production houses. 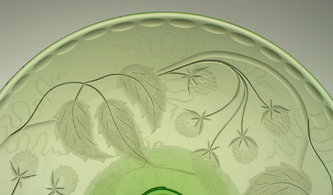 Much of this glass is known today as "Depression Glass'" In reality, Pairpoint glass could also be described as Depression Glass, since it was made during the depression years, but that's where the similarity ends. When Pairpoint was decorated by engraving or cutting, it was done by hand to an incredibly accurate standard. Remember, this glass was too expensive to be afforded by anyone but the Carriage Trade, so the quality expectations were absolute. 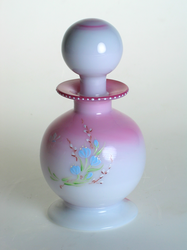 You will occasionally find products by Pairpoint that are not separately finished on their surface, but use a heat process that varies the color and shading within the item. 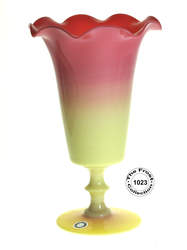 Pairpoint produced "Burmese," "Peachblow," and "Amberina" using a heat-reactive glass that started as one color, but would change colors after it was allowed to cool and then partially reheated to effect a "design,"
On a very limited basis, Pairpoint introduced a few product lines that employed enameled decoration on clear or frosted glass.